The Midwest Pesticide Action Center (MPAC) would like to invite you to the Midwest Grows Green Lawn & Land Forum Workshop. 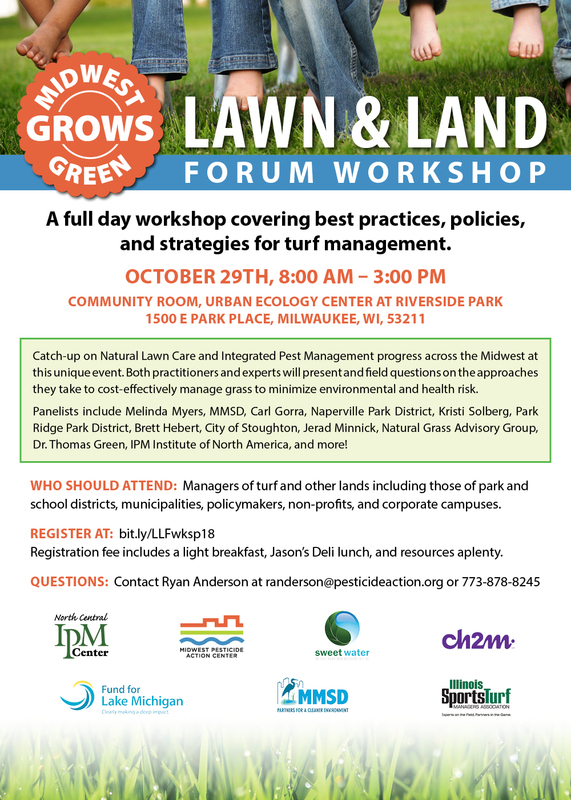 This full-day workshop on Monday, October 29th at the Urban Ecology Center at Riverside Park in Milwaukee will cover Natural Lawn Care and Integrated Pest Management progress in the Midwest. Both turf practitioners and experts will share the approaches they take to cost-effectively manage grass to minimize environmental and health risks. Panelists include representation from Naperville Park District, Park Ridge Park District, City of Stoughton, the Natural Grass Advisory Group, MMSD, the IPM Institute of North America, the Sanctuary Products, and more. Tickets are available now for $30 that include a light breakfast, Jason's Deli lunch, and resources aplenty. After the workshop, MPAC is hosting a fundraiser at Good City Brewing Company. Early-bird tickets are now available for $35 at bit.ly/MGGfundraiser18 that include food, one beer and plenty of entertainment. All funds will go towards 2019 pesticide reduction work in Milwaukee County. After our January green stormwater opportunities workshop for developers and allied professionals, we heard a clear call for more detail on what it takes to get green stormwater practices incorporated into projects - cost-effectively - in the Greater Milwaukee region. This second, more advanced workshop will address stormwater compliance costs, with a detailed look at the costs in our area for green stormwater practices such as permeable pavement, rain gardens / bio-infiltration, and green roofs. This workshop will feature a discussion panel with manufacturers and suppliers of green stormwater treatment systems, along with a presentation on the ongoing stormwater regulations and practices cost study by project contractor, Birchline Planning LLC. 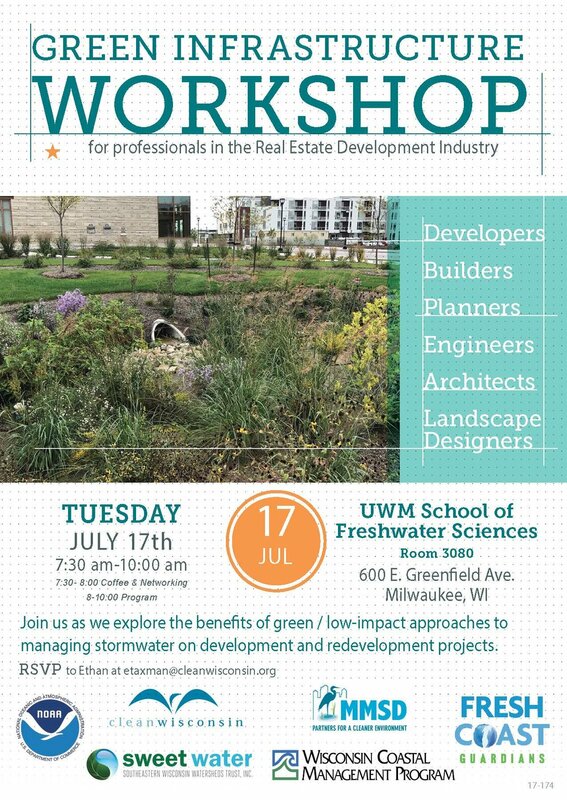 If you’re involved in development and redevelopment projects and your company is already on the leading edge of green stormwater practices, or if you want to take it to the next level, this workshop is for you.